Santa Monica Airport – What Happens Next? 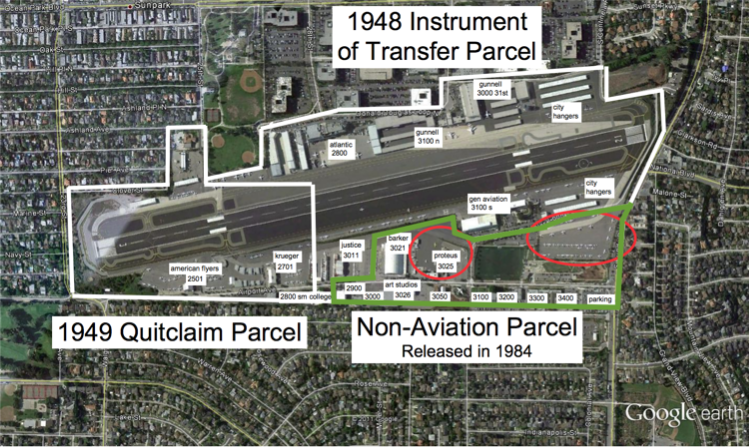 The content following the separating line below is derived from a document recently sent by CASMAT to Council regarding next steps to be taken at the Santa Monica Airport. Council will be taking various actions as a result of the signing of the agreement at their upcoming Council Meeting (Agenda here) including awarding the contract to shorten the runway, and issuing a formal resolution regarding closure. As you can see from the links, the actions planned fall roughly in line with those that we (and others) have advocated. CASMAT would like to thank Council and Staff once again for their support and efforts on behalf of the community regarding the SMO issue. As a result of the agreement, we have reached the point where other than seemingly futile attempts by the aviation lobby to reverse the decree, and other Part-16s/lawsuits that will likely go nowhere, the SMO fight appears to be essentially over. Now the wait for full closure begins. However we need to remain vigilant. The ‘great park’ is in our collective future unless we the people of Santa Monica fall asleep at the wheel. Now the focus switches to building the first phase and planning/building the next two phases of the ‘great park’. This is the best antidote for possible future aviation lobby meddling in City politics, and Airport2Park is the organization set up to work closely with the City for that purpose. People often ask me what they can do to help. Well now the answer is simple. There is little further purpose for ‘anti-airport’ (nor ‘anti-city’) organizations on this matter, the dice are cast and cannot be un-cast, so now we need to be ‘pro-park’. So I say join Airport2Park, sign up to volunteer, get an Airport2Park T-shirt and wear it at public events in the City, help us build even stronger alliances with all who will benefit from the ‘great park’, donate if you can, but most of all don’t let any Council, now or in the future, forget that you want and expect a ‘great park’ as promised by Measure LC (and as a result the City Charter). If we all do these things, it will happen. The Airport2Park foundation was formed to work with the City to bring the ‘great park’ into existence. The current 12 acre Airport Park expansion is just the first of three phases (see 2015 Airport2Park plan video here), with the likelihood of shortening the runway this year, the second exciting phase begins soon as you can read below, and with your help its realization is just a few short years away. Now is the time to be part of creating the future we all hope for ourselves, and more importantly for our children. In recognition of this reality, CASMAT will now wind down our activities and focus on our role within Airport2Park. We will continue to track relevant stories in order to keep you informed, but do not anticipate the need to be active any more in an ‘anti-airport’ role (unless and until we again detect aviation lobby meddling). The war is over and our side, the community and the City, won. Now it is time to win the peace. Airport2Park as an organization has been doing that, and will continue to do so, with your help, until the ‘great park’ is built. On behalf of all of us at CASMAT, thank you all for your support. In particular our thanks to the tireless volunteers who helped CASMAT shed light on the dark mystery that once was SMO starting in 2010. Add to that subsequent efforts like the on-going petitions and studies, the 2012 election campaign, work on the muffler initiative, and of course the epic 2014 campaign against the signature gatherers that led to the formation of CLCSMAL. Without all these the giant boulder that was airport closure would never have started rolling again. Up to that point, it had after all, hardly budged since 1984. Thank you to all that were involved. Over the seven years of its existence CASMAT has played some key roles in getting us all to this point, and of that we can be proud. The closure boulder is now at rest again, right at the finish line. In 2028 (or hopefully earlier!) unless we collectively drop the ball, it finally topples over. City may immediately initiate shortening of the runway from 5,000 ft to 3,500 ft providing such reconfiguration meets FAA standards and provides Runway Safety Areas (RSA) and Engineered Materials Arrestor System (EMAS) at either end. Released land beyond 3,500’ can be repurposed. Costs for this must be born entirely by the City to avoid additional encumbrances. Environmental studies (if required) are the City’s responsibility. City may unilaterally close the Airport completely at the end of 2028. If mutually agreed by the City and FAA, the airport could be closed earlier. Until that time, the City is obligated to operate the remaining airport according to FAA standards. City is released from all encumbrances imposed by earlier agreements with the FAA. After shortening the runway, the City has the right to become an exclusive FBO and provide all fuel services. The City shall initially offer 3 year leases to aviation tenants. Once that FBO is stood up, leases for existing FBO’s providing the similar services may be terminated with 6 months notice. City may apply for an enhanced curfew. City may not restrict the use of leaded fuel. All disputes to be resolved in Federal Courts. FAA and City to jointly defend the agreement against all legal attacks. For the purposes of discussion, it is assumed that the City will chose to center the 3,500 ft runway (plus assumed 300’ minimum length RSAs/EMAS) equidistant from both ends of the existing runway thereby giving equal relief to communities at either end of the existing runway. This seems like the only fair thing to do. A centered runway raises the altitude of aircraft on either side of the runway so reducing noise in both communities, this is most important to the community at the western end. Adding another 750′ of separation from both ends, gives immediate pollution and health relief to all (pollution impacts fall off rapidly with distance), particularly those on the eastern end of the runway where such relief is most needed. No scenario other than this agreement with a centered runway could plausibly have offered this relief for at least another 7 years (i.e., closing the Western parcel would still have left the runway and pollution all the way to the east). The additional separation also somewhat improves safety for all surrounding areas. Figure 2 above shows the layout of the airport with a centered 3,500 ft runway having a 300 ft RSA at either end, and with all Tarmac cleared beyond the 3,500 ft extent of the runway. This implies clearing a total of 1,500 ft of runway and surrounding tarmac that is now beyond the 3,500 ft runway. This is the land referred to as ‘such land’ in the Agreement Section III. In total this cleared area amounts to 12.7 acres at the western end and 17 acres at the eastern end (due to the wider tarmac profile at that end). The distinction between the two original aviation parcels (see Fig 1) is now moot, hence the ability to center the runway. The LAX estimate to remove 150’ by 9,000’ of runway together with its surrounding tarmac comes out to a net cost per square foot removed of $8.66/sf. This presumes a runway of 19” PCC over 12” Econocrete over 12” aggregate base course. For shoulder it assumes 4” AC over 12” aggregate base. The SMO runway is also 150’ wide, but we are removing 1/6th the length. The SMO shoulder is somewhat wider, but still amounts to less than that removed for LAX runway 6L-24R. Working the numbers we come up with a ROM to remove the required SMO surface of between $1.5M and $2M (a bargain compared with ongoing litigation!). The next question would be why go to the expense of actually removing this surface rather than just marking lines on it and telling pilots they should not cross them? To this question there are a number of answers, but they all boil down to the fact that if the surface isn’t removed, the runway hasn’t really been irreversibly shortened, and that is what the community expects. Recommendation 1: Council should direct staff and the contractor that is selected to do the shortening that the only option of interest is one that involves the removal of the entire hard surface that lies beyond the ends of the shortened 3,500’ runway and its restoration to raw compacted topsoil. The two new parcels of land (one at the Western end, one at the Eastern end) that are to the sides of the raised/flat airport surface, and below it at the ends, give us the potential to connect the newly emerging Airport Park expansion to the rest of Santa Monica via easy bike and pedestrian access. This is particularly critical if the playing fields that are part of the expansion are to be used by SAMO High students since they would otherwise be forced to navigate either Bundy or 23rd, both of which are extremely dangerous (particularly the intersection at 23rd). 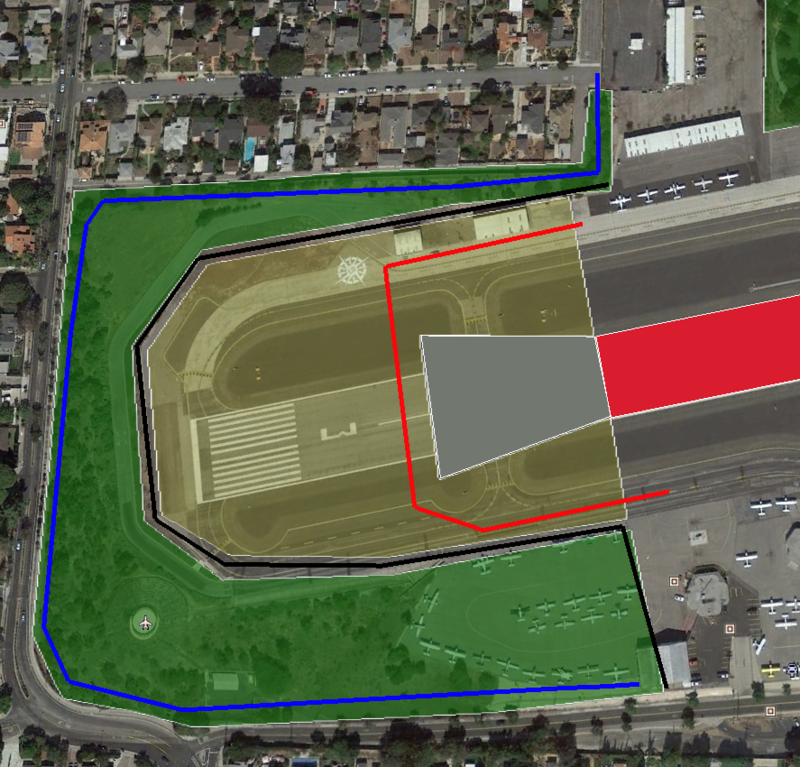 By running two new bike/pedestrian routes (as shown in blue on Figure-3) round either end of the airport, we can resolve this issue while also giving better access to arts and other facilities and to SMC students moving between the main campus and satellites at the airport. The phase-2 contiguous border with the Airport Park expansion needs to be communicated with Mark Rios so that its presence can be incorporated into the Phase-1 park expansion currently in the design phase. As also illustrated in the diagram, there is the potential to extend Centinela past the current north gate into the airport and have it follow the existing road that is currently within SMO grounds to join Bundy to the South of the Ocean Park/Bundy intersection. It is the huge lines of traffic that build up at peak times trying to go South around the airport, particularly onto Bundy, that cause much of the traffic congestion in the local area. This can now be relieved with some new construction since an existing road surface already travels most of the path desired. Figure 4 above shows a detailed view of the proposed additional park space at the Western end, and of a suggested configuration of the revised airport footprint. The first point to realize is that the existing airport peripheral road (seen just inside the proposed inner park boundary) is at the top of a slope that falls from the airport surface down to the level of 23rd street. This slope is already in its natural state consisting of scrub, trees and vegetation along the hillside. The proposal is to move the existing airport perimeter fence (the black line) to just inside this peripheral road, making the road the uppermost limit of the park. This avoids the need to construct a new road through the park (just repurpose the existing road as a new park road), and allows people the potential to climb to this level and see the amazing views it affords (while still being outside the aviation perimeter). Leaving this roadway in place at the top of the hill is likely also necessary to avoid soil erosion issues. A new bike/pedestrian trail (the blue line) would be constructed down-slope and thus out of sight/danger from aircraft taking off from the reduced runway. This new trail would run along Airport Avenue on the south, up the side of 23rd (which would now have an unobstructed view of the new park and trails), and along the northern edge coming out near the fire station (or if possible connecting directly to Clover park behind the row of small hangars shown in the upper right of the image). By so doing this path affords direct pedestrian and bike access to Airport Avenue from the rest of Santa Monica. The existing contract to remove gunnite along Airport Avenue needs to be modified to take account of the planned existence of bike/pedestrian trail along the Western end of the road. A new airport peripheral road (shown in red) would go around the newly installed RSA connecting north and south sides of the field for aviation use. This entire path is already paved, so this road does not need to be ‘constructed’ simply not removed with all the rest of the surface, so saving costs. Note that at South-east limit of this park area there is a paved area of aircraft tie-downs which would be removed and the aircraft re-located. Other than that, and the construction of the new pedestrian/bike path, there is little if any major work to be done over and above tarmac removal for this park to come into use as 10.6 acres of completely un-structured natural habitat parkland marking the Western gateway into the City of Santa Monica. Figure 5 above shows a detailed view of the proposed additional park space at the Eastern end per the suggested configuration of the revised airport footprint. Just as for the changes at the Western end, the existing airport peripheral road (seen just inside the proposed inner park boundary) is at the top of a slope that falls from the airport surface down to the level of Bundy. This slope is already in its natural state consisting of scrub, trees and vegetation along the hillside. The proposal is to move the existing airport perimeter fence (the black line) to just inside this peripheral road, making the road the uppermost limit of the park. This avoids the need to construct a new road through the park (just repurpose the existing road as a new park road), and allows people the potential to climb to this level and see the amazing views it affords (while still being outside the aviation perimeter). Leaving this roadway in place at the top of the hill is likely also necessary to avoid soil erosion issues. A new bike/pedestrian trail (the blue line) would be constructed down-slope and thus out of sight/danger from aircraft taking off from the reduced runway. The slope at this end is somewhat narrower in places so some widening might be required. This new trail would run along Bundy (which would now have an unobstructed view of the new park and trails), and along the northern edge of the existing open space (through the existing shady tree lined ‘avenue’ along the northern edge of the existing airport boundary, ending at the current airport gate at what is currently the end of Centinela. By so doing this path affords direct pedestrian and bike access to the expanded airport park from the rest of Santa Monica. A new airport peripheral road (shown in red) would go around the newly installed RSA connecting north and south sides of the field for aviation use. As for the western end, this entire path is already paved, so this road does not need to be ‘constructed’ simply not removed with all the rest of the surface. Once again this saves costs. The existing natural land to the north surrounds a parking lot which should be removed. To the Western end at the top (to the west of the line of Centinela within the airport boundary), an area of small hangars is freed up from aviation use and could thus be cleared for further park space, or alternatively converted to a parking lot for both park and aviation use (thus this tarmac would not be removed). Along the very top of this area is a road (currently within the airport boundary) which would remain, and on it, at the point where the new airport perimeter fence (black line) meets the road, a new security gate would be installed for entrance to the remaining aviation area. On the southern side of the runway, a large additional area of aircraft tie-downs and some small hangars is released from aviation use. This area is contiguous with the existing Airport Park expansion and so should meld naturally with it. It is presumably too close to the end of the runway to put playing fields, so perhaps it too should be left as natural habitat for now (minimal cost) with just a few trails added to allow people to enjoy it and the incredible views it affords. In effect at the Western end of the runway, combining north and south parks and the strip of connecting land, we would have created a single contiguous park of nearly 40 acres with a mix of natural habitat to the north and planned uses to the south. Views of this park would delineate the Eastern gateway for people coming into Santa Monica. 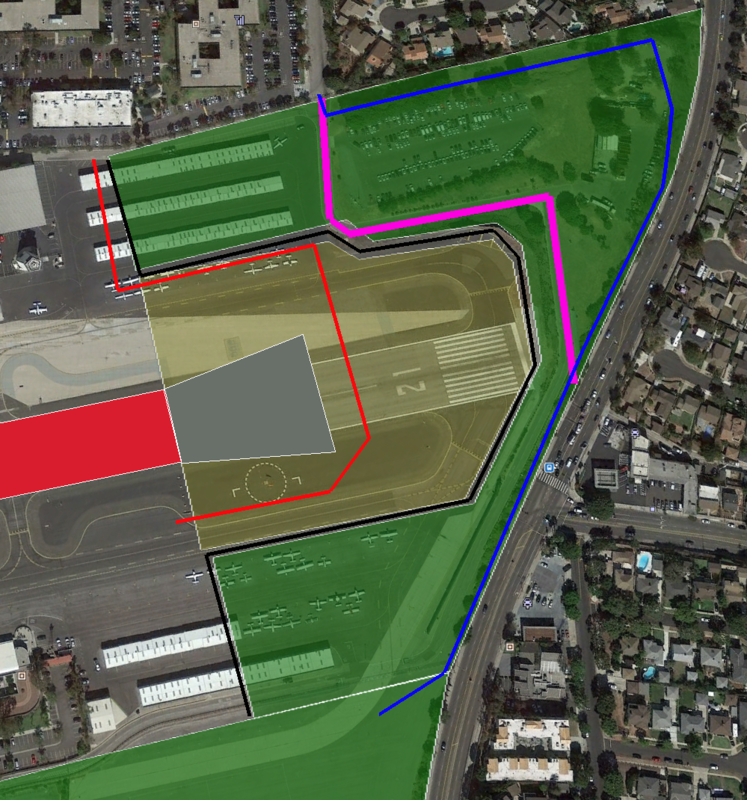 As mentioned earlier (see purple line), it is also possible to continue Centinela along the path it already follows within the current boundary turning east towards Bundy and along the end of the runway (all existing roadway) and then extend it down the slope to join Bundy at an angle, so affording a path for traffic going south to avoid the Bundy/Ocean Park intersection. This would greatly relieve traffic congestion on Ocean Park by avoiding this intersection, indeed traffic originating from the Business Park could emerge directly onto Centinela so avoiding the need to ever join Ocean Park and thus extending traffic relief all the way back along Ocean Park. Another possibility is to construct a new road through the tree-lined avenue (which should be preserved) on the northern edge and then down to Bundy (i.e., the blue line in Figure 5). This is more construction work, but means the Centinela cut through would no longer split the newly created park space in half as it would otherwise. Recommendation 2: Authorize staff immediately to begin planning for this new phase-2 park space and its integration with the existing phase-1 airport park expansion, including initiating a phase-2 visualization process. At the same time the contractor tasked with clearing runway surfaces needs to be informed of those areas of surface that should be left in order to play their new role in the expanding great park vision. No doubt you have received numerous recommendations and justifications relating to the more obvious actions to be taken in pursuit of the newly signed agreement. For that reason I won’t belabor these points and will simply list them below. Recommendation 3:Immediately give formal 6 month notice (with expected timeframe) to FAA and SMO FBO’s and tenants of City’s intent to shorten the runway as expeditiously as possible, and following that to become an exclusive FBO provider. Fast track this process. Evict existing FBOs as soon as allowed by the agreement. Recommendation 4:Do not take any new money from FAA that might encumber the City. Incorporate language to this effect into the wording of the “resolution to close”. Recommendation 5:Strictly enforce the existing noise ordinances including fines and suspensions applied on a per-entity/operator (as the ordinance reads), not a per-aircraft basis . Recommendation 6:Continue to fast track improved Airport security measures, including TSA style baggage inspections to access airport facilities. Recommendation 7:Ensure all leases are at market rate. Continue policy of offering leases to desirable interested non-aviation tenants as for Snapchat. Recommendation 8:Require installation of (subsidized) mufflers (depending on A/C type) per City’s existing voluntary subsidy program (not one volunteer in 4 years!) as a condition of all flight school leases. Seek a way to cause flight schools to abide by the intent of the pattern flying ordinance (no pattern work on weekends, holidays, or evenings). Recommendation 9:Following runway shortening, begin planning and other activities including preparing for funding and visioning of the ‘great park’ (phase-3) to ensure that on January 1, 2029 park building can begin immediately. ← A historic victory … a long wait! What a SCAM…The Western Parcel should have been removed from aviation uses back in 2015. Corruption seems to be a way of life here in lovely Santa Monica. There’s no reason for a recreational airport to have a runway over 2500 feet, 2000 feet would be just fine, leaving 1500 feet at each end for safety. Would that that had been possible, but alas it was not. You say that shortening the runway at each end will raise the altitude of departing aircraft. But, the opposite is true. Aircraft don’t lift off the ground at the end of a runway like they were launching from an aircraft carrier, and they don’t stay on the ground longer just because they have a longer runway. (There is a slight exception to this for airliners, which will sometimes use lower power settings on longer runways, but that is not relevant to aircraft that operate out of Santa Monica.) For any given aircraft that can still use the airport, the aircraft will start its takeoff run closer to your home, will lift off the runway closer to your home, and will reach a lower altitude by the time it reaches your home. The aircraft that can still use the airport will be louder over your home than they are today. That makes the muffler idea–which I strongly support–more urgent. You are correct that it has been a failure to date. But, I think you need to carefully look at why. There is exactly one aircraft that had a muffler installed: Joe Justice’s Cessna 172. Unfortunately, that aircraft was banned from the airport as part of the Justice Aviation settlement. Justice sold the plane to a company in Fort Lauderdale. I’m sure that the folks in Florida appreciate the quieter plane, but it isn’t doing anyone in Santa Monica any good. And the lesson to other aircraft owners is that efforts to be quieter won’t actually buy you anything in terms of better treatment by the city. The muffler subsidy program as it was enacted still asked aircraft owners to spend a significant amount of money to modify their aircraft in a way that didn’t benefit them or increase the resale value of their aircraft, in the hope that they might placate you and other anti-airport folks. But, at the same time the city refused to give new leases and threatened all sorts of efforts to close the airport and harass its users. An aircraft owner had no assurances that they would be able to keep the aircraft at the airport long enough to justify the investment and no real reason to believe their efforts to operate more quietly would be met with a more accommodating attitude from you and your fellow activists. If you actually want mufflers to happen, you need to push for the city to (1) pay the entire cost, and/or (2) offer meaningful guarantees that modified aircraft can use the airport and that the airport will remain a place worth using. The cost we are talking about here are pretty small–less than the costs of the Justice or JetSuiteX settlements, and much less than what the city has been spending on the legal battle. If you aren’t willing to ask the council to foot the entire bill for mufflers, I find it hard to take your complaints about noise very seriously. The airport’s here for the next 12 years. Do we want to work together to make things like the muffler program actually work? Or do you want to spend the next 12 years fighting and looking for every little way that you can make life unpleasant for airport users? The voluntary muffler program was a failure for one reason and one reason only. Because the SMO aviation community didn’t care enough to do anything about the impacts they have on the people below them, even if the City subsidized them to do it. The latest SMAA tactics of trying to frame themselves as the ‘good guys’ that ‘care’ and ‘want to work together’ are clearly a farce precisely because if they had really cared in the past, at least ONE of them would have installed a muffler. Joe Justice’s 172 muffler was installed at City expense so that the plane could be used to conduct the noise measurement tests to see if the muffler worked. I took part in those tests, and it absolutely did work! That is why I continue to push for mufflers. Despite having to replace exhaust systems on a periodic basis, not one pilot or organization in all the years since made the choice to consider the surrounding community and add the very reasonable incremental cost for a subsidized muffler instead. Ok guys, message received. This attitude only served to harden community positions to the point where closure rather than mitigation was clearly the only option. At the point we have reached, it is the aviation community that need to show they are willing to change their ways, but we all know that is not going to happen voluntarily, so yes I do believe that regrettably the only way to proceed may be to force good behavior upon them. And as to if shortening the runway will raise noise or lower it, that as we both know needs to be modeled based on the fleet mix. It is clear that at least on approach noise will be lowered, however what happens on departure noise-wise is unclear. For jets that need a longer runway, the option of a lazy takeoff is gone. You are right, many take off long before the end of the runway, but I have also observed many jet takeoffs that simply don’t bother and as a result take off late and pass relatively low over the community to the west. When you know you only have 3,550′ of runway, the tendency will be to take off as fast as possible, so the effect of the shift is not only a matter of physics, but also of pilot behavior. The truth is that the balance of power has shifted seismically in favor of the City and the community, so demanding guarantees of airport longevity, or indeed of anything much else, is not going to get you anywhere, just as demanding voluntary good behavior from the SMO aviation community got us nowhere for all these years. Bad karma has a way of being repaid in the end. Clearly many of the noisiest aircraft, the ones that tend to commit noise violations, will no longer be using SMO, so overall the noise at both ends will go down. With the installation of mufflers, prop plane noise would undoubtedly drop dramatically all around.